After some extensive research (two nights at anchor), I have determined that sea lions never sleep. When we got to the anchorage in Santa Cruz last night we heard some occasional barking from some of them. Nothing too crazy. As the sky grew darker, their calls became louder. What they talked about all night, Neptune only knows. Other than crummy sleep, I was super excited for today. All we had to do was cross Monterey Bay. Only about 20ish miles to cover, which meant that I didn’t have to wake up before the sun and I could have a slow leisurely morning. There was time to toast a bagel (sourdough and cheddar from the Berkeley Bowl- highly recommend) and enjoy french press coffee in a non-travel mug. Far better than lukewarm oatmeal and instant coffee. This morning lived up to the hype and then some. Some guy drove by on a jet ski while wearing a helmet and looking at some sort of monitor so I was curious enough to poke my head outside. There was more silent screaming because there was a mother and baby otter hanging out not far from the boat. The amount of marine life here is amazing. The forecast called for about 14 knots of wind and there was enough sun to be warm by 9am. All signs pointed to a great little day sail across the bay. The start of the fog. Well first the fog rolled in. It wasn’t too thick and we were still sailing nicely. 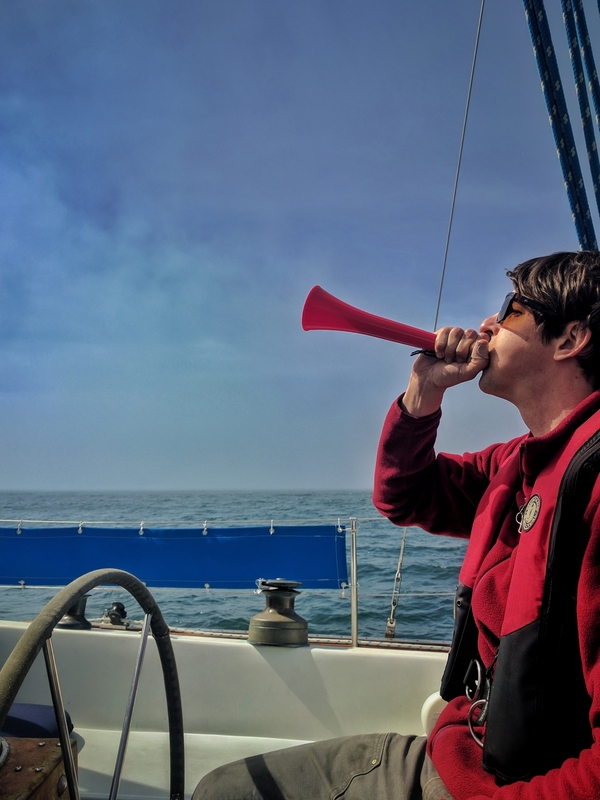 We don’t have a great fog horn so we use a vuvuzela and just sound like a sad little duck. It’s funny and embarrassing at the same time. A guy and his horn. 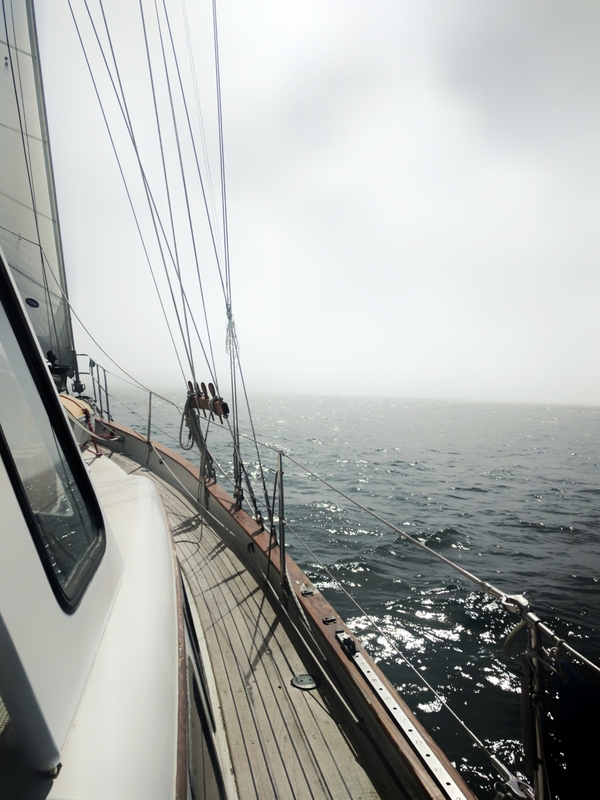 Then the wind kicked up and the fog got thicker so we reefed the mains’l. Then the wind kicked up some more and we reefed the mains’l again. Then the wind kicked up some more and we struck the mains’l all together. We were still going over 6 knots with just the offshore jib and mizzen up. That sounds fine and dandy but the swell was off our stern quarter and kept things sporty, as Craig likes to say. By sporty he means that it felt like we were in a washing machine. You guys. I didn’t barf. In fact, I was steering for most of the day and really showed Craig how it’s done. We sailed the whole way and I was kinda stressed about a lot of it. Craig, of course, loved every second. For me, the fog really intensifies the whole situation. I can’t see very far so I have to rely on the radar to see other solid objects for me. But the radar doesn’t pick up crab pots. I swear, there has to be a fishing boat that goes directly in front of us and lays a path of crab pots. How are they everywhere? It’s a god damned mine field! When the wind and the swell are tossing the boat around, I don’t feel like I have the same maneuverabilty for dodging the crab pots when I see them at the last minute (if I see them at all). Sailing over them risks getting their line wrapped around the propeller which is something I hope to never do. Now everyone knock on wood. Basically, I really feel like I earned this wine that I’m drinking right now. I was supposed to be drinking it on shore on the beach, but it turns out you need a wine key when the bottle has a cork. Lesson learned. The dinghy now has it’s own wine key. After being greeted by more otters and jumping sea lions, we (Craig) rowed all the way to shore with our little camping chairs (thanks friends!) and our bottle of wine (thanks Holly and Caleb!) and we were so excited to be on land. 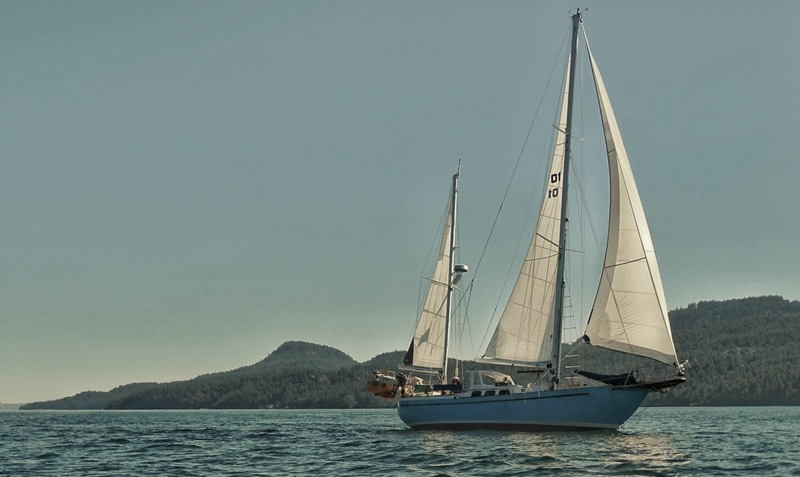 We hadn’t left the boat since Monday and after a tense sail, I just wanted to be on solid ground. And also have wine. It was still nice to be off the boat and able to walk more than 30ft in one direction. As you can tell, it was a horrible day because I didn’t see a single whale. Problem is, it’s been 20 years, and I’m starting to have the same nightmare, AGAIN! Have a safe trip. Oh yeah, and while you’re there, say ‘Hi’ to your Representatives. You remember that all these years later?! Must be delightful to hear to vuvuzela act as a fog horn. I like Todd’s way of referring to the wind picking up. He says it’s “freshening”. We say that, too! Classic sailor speak!